Download "The Department of Education. in Science and Technology"
3 1. Overview: M.Sc. and Ph.D. Graduate Studies programs in Science and Technology Education In the framework of its graduate studies (M.Sc. and Ph.D.), the Department of Education in Science and Technology offers the following specializations with emphasis on STEM content or related aspects in: physics education, chemistry education, biology education, mathematics education, computer sciences education, mechanical engineering education, electrical engineering education, environmental education, outdoor learning environments, gifted and excellent pupils, evaluation of educational programs and educational projects, learning sciences, and advanced technologies in education. The advisor tailors a detailed educational program for each student, in accordance with the student's interests, background and chosen specialty. Study track with thesis Educational Programs for the Master's Degree This program includes research and professional studies. The purpose of the master's research is to familiarize the student with research methods and implementation of a research project emphasizing scientific and analytical approaches. Students who complete this track are awarded: - Master of Science in Education in Science and Technology (M.Sc.) if they have or complete a teaching certificate, or - Master of Science (M.Sc.) if they do not have a teaching certificate. Comply with the detailed requirements listed in Section 2.1, accepted are candidates holding a B.A., B.Sc. or B.Ed. (4 year programs only) or B. Tech (4 year program only) in mathematics, computer science, engineering professions, sciences or science education, educational professions, psychology or statistics. The requirements for this track include studying required subjects in accordance with the instructions specified below, conducting research, submitting a research thesis and acceptance of the thesis by the referees during the final examination. 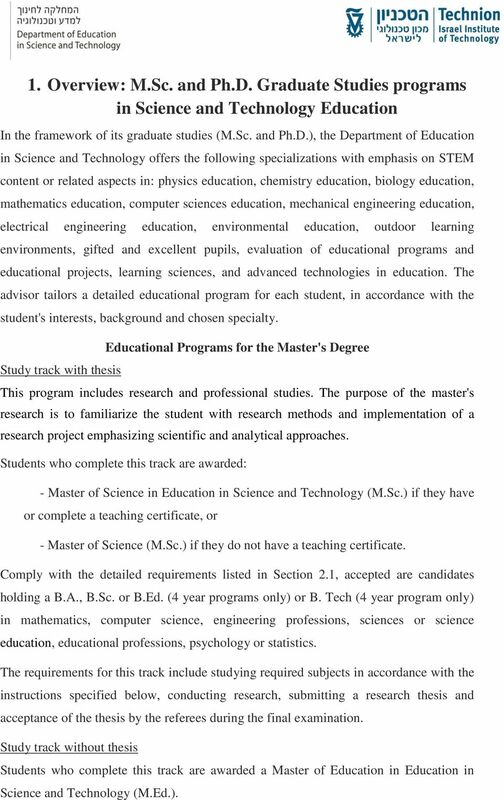 Study track without thesis Students who complete this track are awarded a Master of Education in Education in Science and Technology (M.Ed.). 4 Comply with the detailed requirements listed in Section 2.1, accepted are candidates holding a B.A., B.Sc., B.Ed., (4 year program only) or B. Tech (4 year program only) in mathematics, computer science, sciences, engineering professions, or science education. Candidates in this track are required to study subjects in accordance with the instructions specified below. 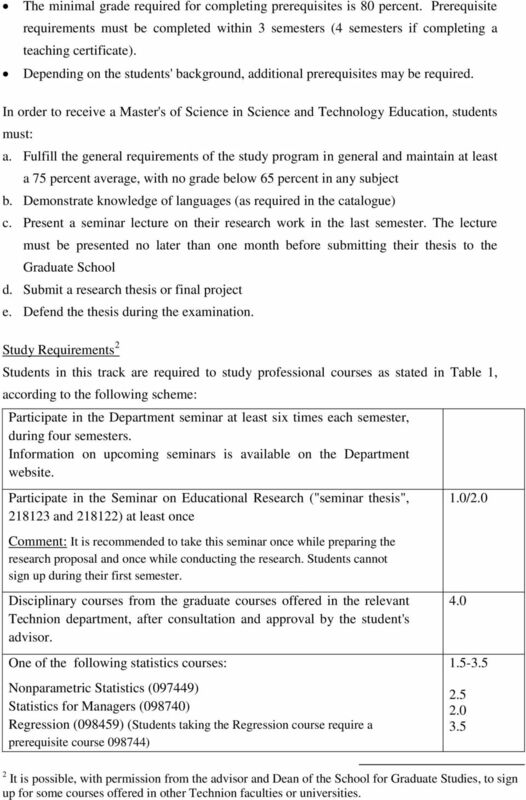 Candidates in this track are not required to submit a research thesis. Educational Program for the Ph.D. Degree Candidates are awarded a Doctor of Philosophy (Ph.D.) Regular Doctoral Program: Candidates are accepted in accordance with the detailed requirements outlined in Section 3 for students holding a M.A. or M.Sc. 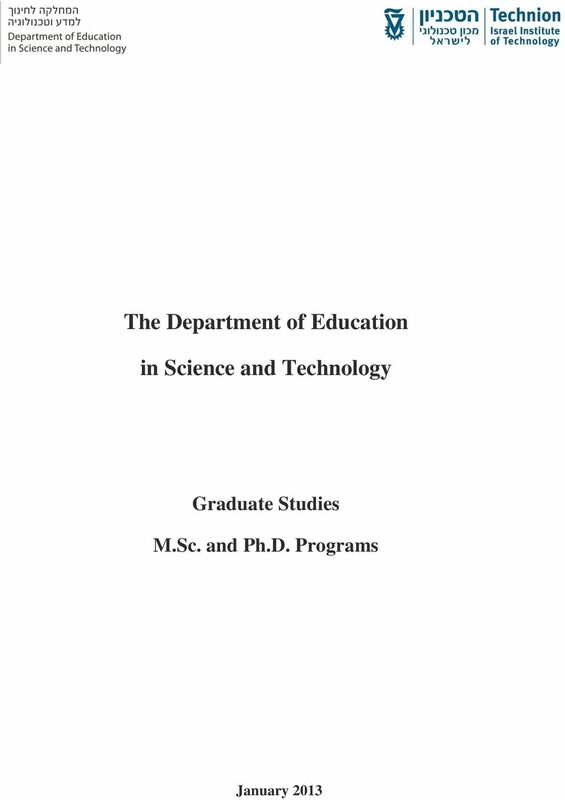 (with thesis) in mathematics, computer science, life sciences, engineering professions, science education and educational professions, psychology and statistics. 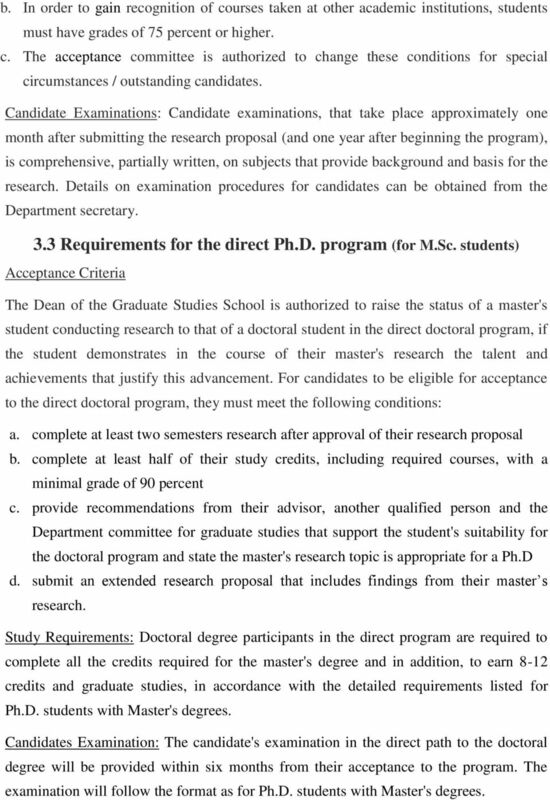 Direct Doctoral Program: Candidates are accepted in accordance with the detailed requirements outlined in Section 3, who are currently students in the Master's program (with thesis) and have demonstrated excellence in learning and research. Comments All candidates are required to meet the standards/criteria of the School of Graduate Studies (listed in the School of Graduate Studies catalogue). Candidates may receive full or partial scholarships upon available funding. 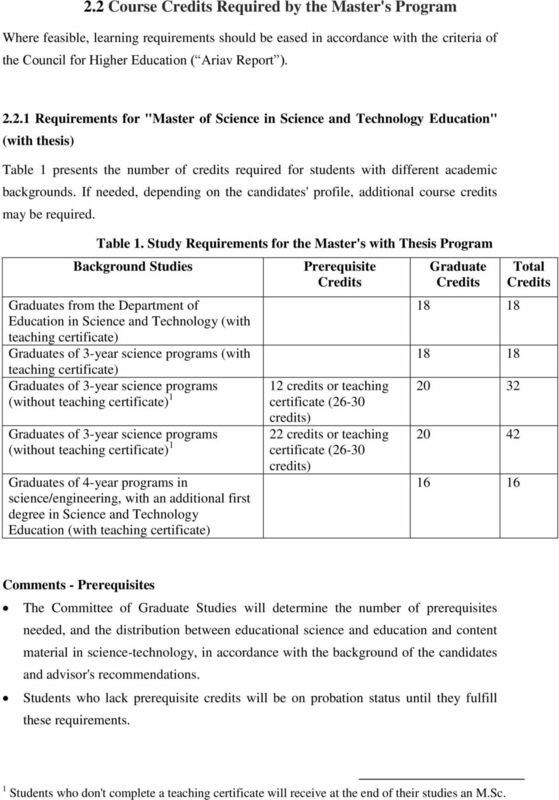 6 sciences and science education necessary for the certificate (within the first 3 semesters). B.Sc. and B.A. graduates in 3-year programs without a teaching certificate can be accepted to a Master's program on condition they complete an additional 22-credits in learning sciences/science education and relevant content courses. Students are required to complete these requirements within the first 3 semester (4 semesters for students working towards a teaching certificate). 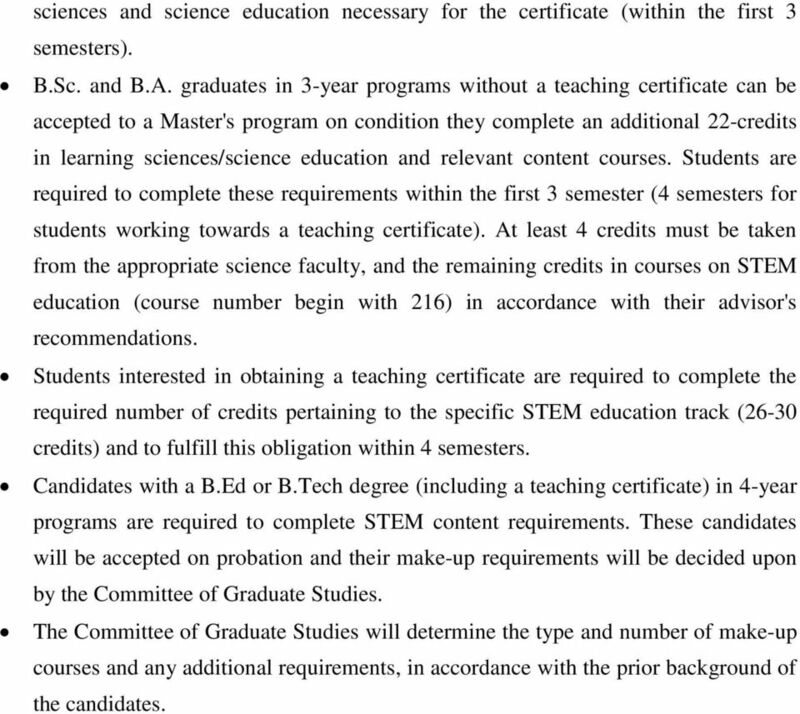 At least 4 credits must be taken from the appropriate science faculty, and the remaining credits in courses on STEM education (course number begin with 216) in accordance with their advisor's recommendations. Students interested in obtaining a teaching certificate are required to complete the required number of credits pertaining to the specific STEM education track (26-30 credits) and to fulfill this obligation within 4 semesters. 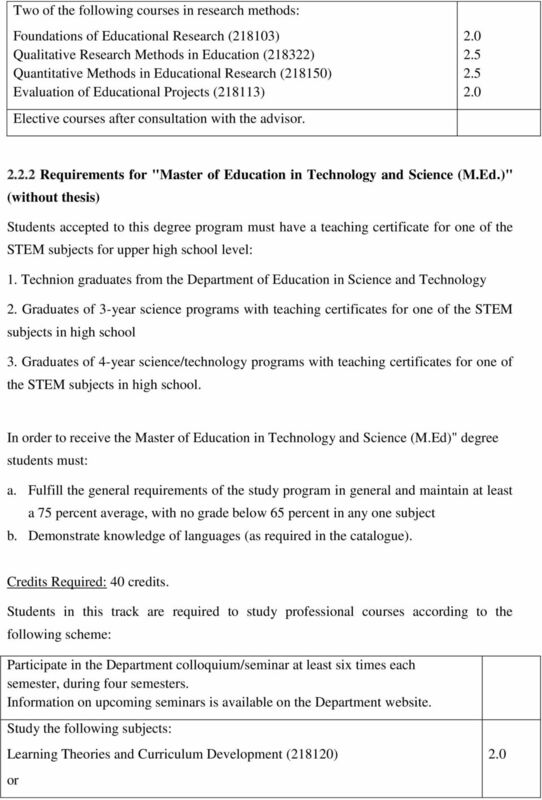 Candidates with a B.Ed or B.Tech degree (including a teaching certificate) in 4-year programs are required to complete STEM content requirements. These candidates will be accepted on probation and their make-up requirements will be decided upon by the Committee of Graduate Studies. The Committee of Graduate Studies will determine the type and number of make-up courses and any additional requirements, in accordance with the prior background of the candidates. 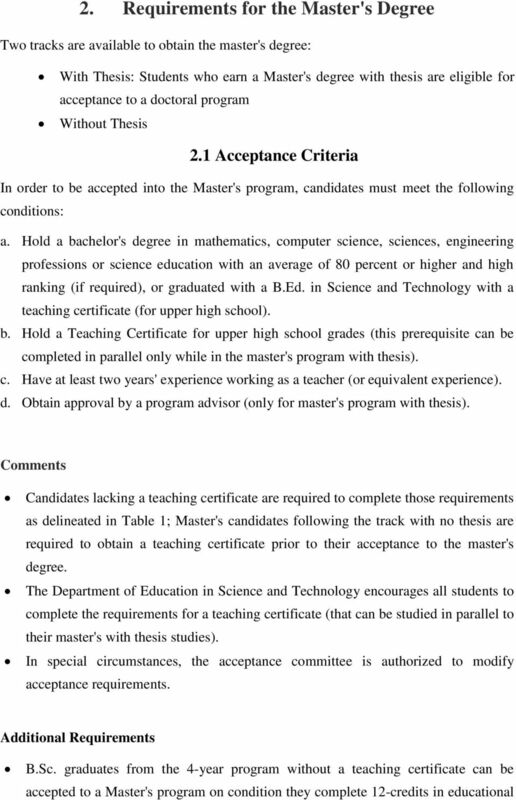 7 2.2 Course Credits Required by the Master's Program Where feasible, learning requirements should be eased in accordance with the criteria of the Council for Higher Education ( Ariav Report ) Requirements for "Master of Science in Science and Technology Education" (with thesis) Table 1 presents the number of credits required for students with different academic backgrounds. If needed, depending on the candidates' profile, additional course credits may be required. Table 1. Study Requirements for the Master's with Thesis Program Background Studies Graduates from the Department of Education in Science and Technology (with teaching certificate) Graduates of 3-year science programs (with teaching certificate) Graduates of 3-year science programs (without teaching certificate) 1 Graduates of 3-year science programs (without teaching certificate) 1 Graduates of 4-year programs in science/engineering, with an additional first degree in Science and Technology Education (with teaching certificate) Prerequisite Credits 12 credits or teaching certificate (26-30 credits) 22 credits or teaching certificate (26-30 credits) Graduate Credits Total Credits Comments - Prerequisites The Committee of Graduate Studies will determine the number of prerequisites needed, and the distribution between educational science and education and content material in science-technology, in accordance with the background of the candidates and advisor's recommendations. Students who lack prerequisite credits will be on probation status until they fulfill these requirements. 1 Students who don't complete a teaching certificate will receive at the end of their studies an M.Sc. 8 The minimal grade required for completing prerequisites is 80 percent. Prerequisite requirements must be completed within 3 semesters (4 semesters if completing a teaching certificate). Depending on the students' background, additional prerequisites may be required. In order to receive a Master's of Science in Science and Technology Education, students must: a. Fulfill the general requirements of the study program in general and maintain at least a 75 percent average, with no grade below 65 percent in any subject b. Demonstrate knowledge of languages (as required in the catalogue) c. Present a seminar lecture on their research work in the last semester. The lecture must be presented no later than one month before submitting their thesis to the Graduate School d. Submit a research thesis or final project e. Defend the thesis during the examination. Study Requirements 2 Students in this track are required to study professional courses as stated in Table 1, according to the following scheme: Participate in the Department seminar at least six times each semester, during four semesters. Information on upcoming seminars is available on the Department website. Participate in the Seminar on Educational Research ("seminar thesis", and ) at least once Comment: It is recommended to take this seminar once while preparing the research proposal and once while conducting the research. Students cannot sign up during their first semester. 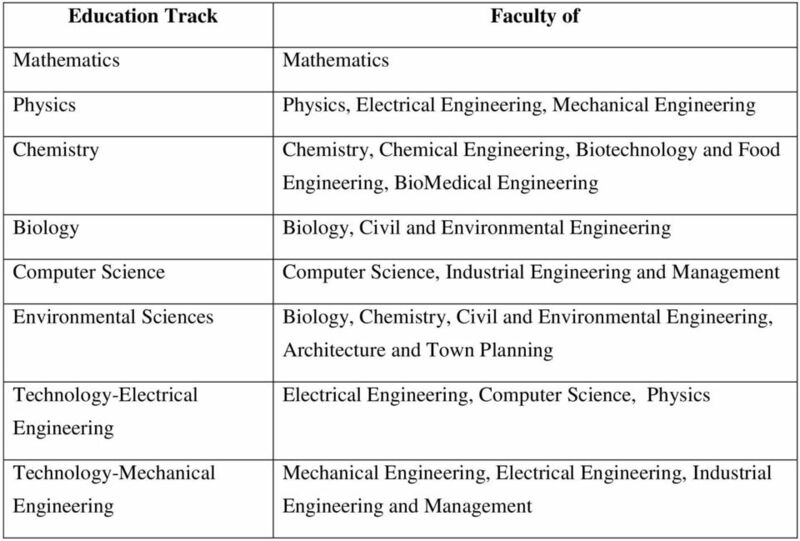 1.0/ Disciplinary courses from the graduate courses offered in the relevant Technion department, after consultation and approval by the student's advisor. One of the following statistics courses: Nonparametric Statistics (097449) Statistics for Managers (098740) Regression (098459) (Students taking the Regression course require a prerequisite course ) It is possible, with permission from the advisor and Dean of the School for Graduate Studies, to sign up for some courses offered in other Technion faculties or universities. 13 Course Name Course # Credits Foundations of Educational Research Quantitative Methods in Educational Research Qualitative Research Methods in Education Regression The number of study credits is determined based on the criteria below: 1. Candidates with a M.Sc. 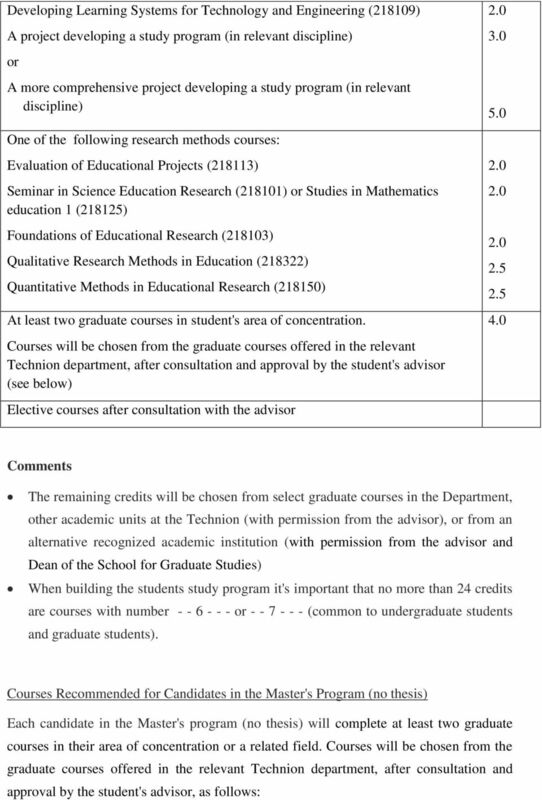 from the Department of Science and Technology Education at the Technion that completed two of the methodology courses listed above are required to complete 8 graduate credits. 2. 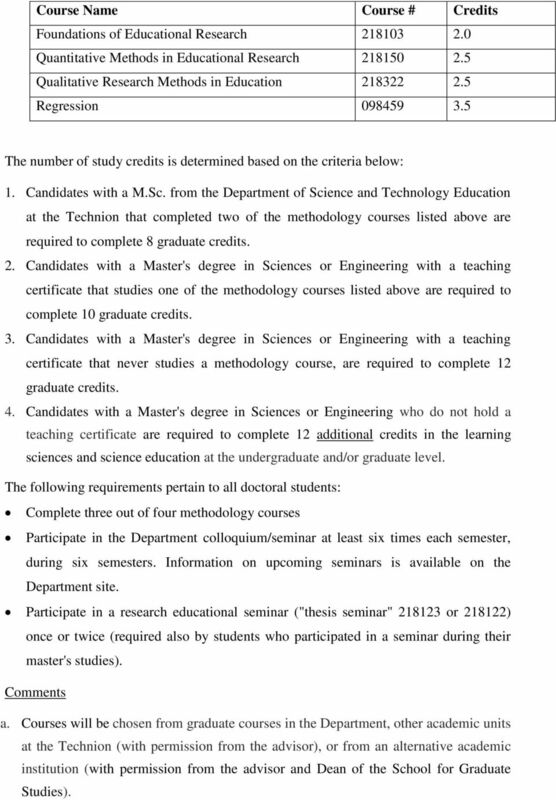 Candidates with a Master's degree in Sciences or Engineering with a teaching certificate that studies one of the methodology courses listed above are required to complete 10 graduate credits. 3. Candidates with a Master's degree in Sciences or Engineering with a teaching certificate that never studies a methodology course, are required to complete 12 graduate credits. 4. Candidates with a Master's degree in Sciences or Engineering who do not hold a teaching certificate are required to complete 12 additional credits in the learning sciences and science education at the undergraduate and/or graduate level. The following requirements pertain to all doctoral students: Complete three out of four methodology courses Participate in the Department colloquium/seminar at least six times each semester, during six semesters. Information on upcoming seminars is available on the Department site. Participate in a research educational seminar ("thesis seminar" or ) once or twice (required also by students who participated in a seminar during their master's studies). Comments a. 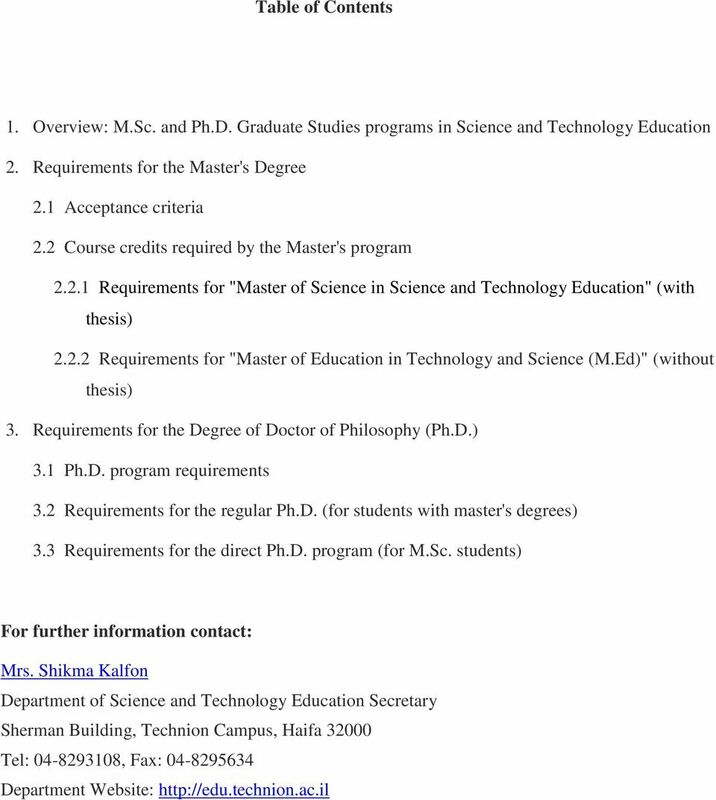 Courses will be chosen from graduate courses in the Department, other academic units at the Technion (with permission from the advisor), or from an alternative academic institution (with permission from the advisor and Dean of the School for Graduate Studies). 14 b. In order to gain recognition of courses taken at other academic institutions, students must have grades of 75 percent or higher. c. The acceptance committee is authorized to change these conditions for special circumstances / outstanding candidates. Candidate Examinations: Candidate examinations, that take place approximately one month after submitting the research proposal (and one year after beginning the program), is comprehensive, partially written, on subjects that provide background and basis for the research. Details on examination procedures for candidates can be obtained from the Department secretary. 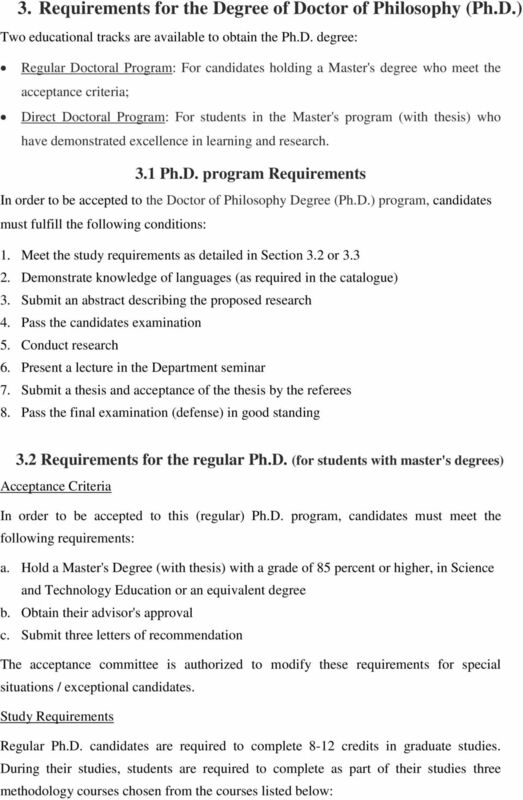 3.3 Requirements for the direct Ph.D. program (for M.Sc. students) Acceptance Criteria The Dean of the Graduate Studies School is authorized to raise the status of a master's student conducting research to that of a doctoral student in the direct doctoral program, if the student demonstrates in the course of their master's research the talent and achievements that justify this advancement. 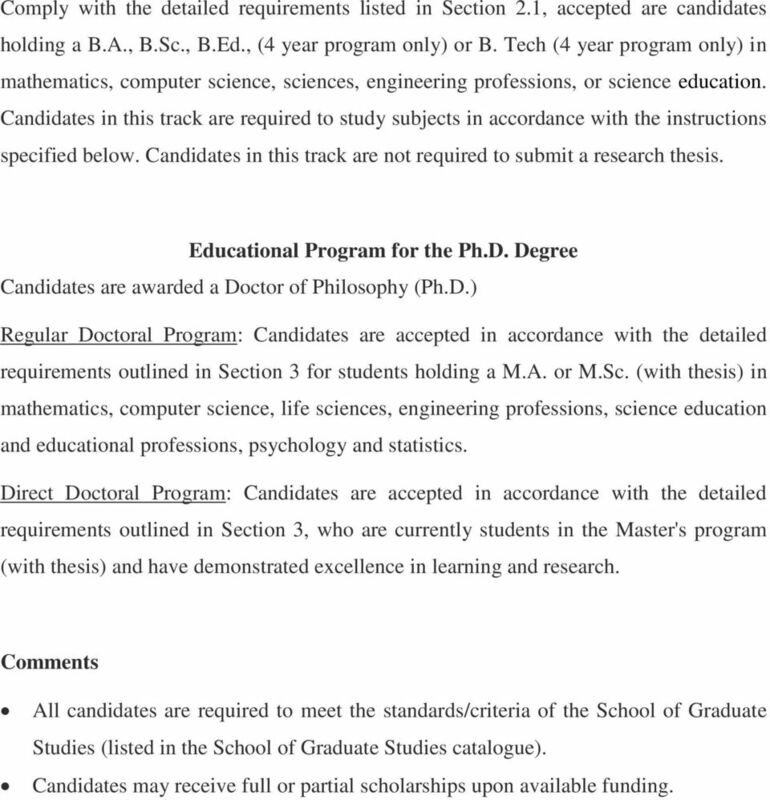 For candidates to be eligible for acceptance to the direct doctoral program, they must meet the following conditions: a. complete at least two semesters research after approval of their research proposal b. complete at least half of their study credits, including required courses, with a minimal grade of 90 percent c. provide recommendations from their advisor, another qualified person and the Department committee for graduate studies that support the student's suitability for the doctoral program and state the master's research topic is appropriate for a Ph.D d. submit an extended research proposal that includes findings from their master s research. Study Requirements: Doctoral degree participants in the direct program are required to complete all the credits required for the master's degree and in addition, to earn 8-12 credits and graduate studies, in accordance with the detailed requirements listed for Ph.D. students with Master's degrees. Candidates Examination: The candidate's examination in the direct path to the doctoral degree will be provided within six months from their acceptance to the program. The examination will follow the format as for Ph.D. students with Master's degrees.